In the 15 years since Morgan Freeman starred in the first Alex Cross movie, Kiss the Girls, I’ve enjoyed quite a few James Patterson thrillers in films, books, and audiobooks. He knows how to keep you on the edge of your seat, whatever the medium. Alex Cross, Run, the 20th tale in the series, is no exception. When I’m doing a lot of driving, I often choose Patterson audiobooks – they make the miles fly, but once I started this one, I kept the earbuds plugged in while fixing breakfast, walking the dogs, and even late at night. It wasn’t exactly pleasure that kept me listening. It often felt like drinking coffee when nervous. There’s an amped up quality to Alex Cross, Run that couldn’t quite hide a formulaic quality, even though Patterson created much of the formula. Throw in enough serial killers – Alex Cross Run had three – and an author like Patterson will create plenty of tension, but I often felt manipulated. Every book tries to manipulate an audience; successful ones do it with subtlety. Here, elements like bad guy motives and family interludes felt somewhat perfunctory, like I might do if I started with a list of plot points and checked them off one by one. Alex Cross, Run is not a bad book by any means. I’d give it three and a half stars out of five. It’s a thriller by any measure, but it adds nothing new to the series or the genre. Perhaps it simply felt rushed compared to books I’ve read in Patterson’s other signature series, the “Women’s Murder Club.” I find Lindsay Boxer a more rounded character, with a richer circle of friends and environment than Alex Cross. 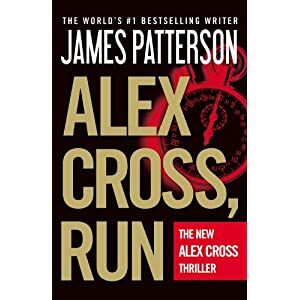 Any reader who likes thrillers and any writer who wants to learn about tension will be rewarded by reading James Patterson, but Alex Cross, Run is not where I would advise them to start. This entry was posted in Authors, Book Reviews, Books and tagged Alex Cross Run, authors, book reviews, books, fictional characters, James Patterson. Bookmark the permalink. I think I mentioned before, I have only read one James Patterson book, Beach Road, and it was simply awful. I’ve never read another. I think I skip this one as well. Thanks for the heads up. I don’t think I’ve come across one of his I’d call “awful,” though I’m sure they exist. I do remember pushing him on Robert for the sake learning to build and create tension (Robert wasn’t buying it). Back in cassette days, I remember driving to Oregon on vacation once, with Mary and my dad, and I picked up a Zane Grey western to listen to on the drive. At a minimum, a lot of action-adventure books work like that – great car tapes. That’s one reason I usually now sample them as audio books. “Here, elements like bad guy motives and family interludes felt somewhat perfunctory, like I might do if I started with a list of plot points and checked them off one by one.” Very interesting comment. I didn’t catch the formulaic writing, perhaps because I don’t often read thrillers. My complaint was the grammar. Did you notice that every time someone asked a question, it was “Talking talking talking?” Someone said. Said. At first it was a small thing, but especially because I listened to it as an audiobook it was driving me up the wall by the end. I really should have rated it lower than I did, but it made me cry at the end and sitting in my car, unwilling to leave the CD in the car until I’d reached a stopping point. Interesting point Ermilia. I hadn’t really tuned in on that. I felt manipulated so that by the time I reached the loss at the end, it felt like melodrama, like the authors signaling, “Cry now.” And my response was, “Nuh-uh!” Seriously – there’s a qualitative difference for me between events that truly evoke sadness and loss (like Frodo leaving Middle-Earth) and something that feels forced – this ending was the latter for me. I’ve come to like thrillers, and I often listen to them while driving. If I had to recommend just one, I might still pick “So Cold the River” 2010 by Michael Koryta. I reviewed it here, though not very well by my present standards, but I listened to the audio book and it’s gripping. I cry pretty easily. I was too busy comparing it to Guilty Wives by James Patterson and liked this one better though I would reread neither and probably not pick up another.